Where to find the magnum in Resident Evil 2. 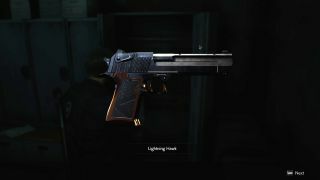 As is Resident Evil tradition, the magnum, or Lightning Hawk, is the most powerful handgun in the game, and an absolute beast against its many hideous bosses. But you'll have to jump through a few hoops to get it. After you pick up the Spade Key, head to the library on the second floor of the police station. To the immediate right of the entrance that leads to the main hall is a small reading table with a Red Book on it. Pick up the book. Exit to the main hall and, staying on the second floor, go through the door on the opposite side, which leads to the art room. Here you'll find a statue with an Arm next to it. Pick up the Arm and combine the Red Book with it, then use the combined object on the statue. The statue will activate and release a Scepter. Examine it and you'll receive a Red Jewel. Now go to the interrogation room on the first floor of the station, where you'll find a Bejewelled Box. Combine this with the Red Jewel. Inside you'll find a S.T.A.R.S. Badge. Examine this in your inventory and spin it around until you see an interaction point. Interact with it and the badge will become a USB Dongle Key. This can then be used on the computer in the S.T.A.R.S. office on the second floor to unlock the magnum.